Under U.S. DOT Commissioner Elaine Chao, the Federal Transit Administration is dragging out the disbursement of expansion grants and threatening to stop releasing capital funds to transit agencies altogether. At issue is the release of funds that have already been appropriated by Congress for the FTA’s Capital Investment Grants program. CIG has three components: New Starts and Small Starts, which fund transit expansions, and Core Capacity, which funds upgrades to existing routes. Together, the three grant programs were funded with $2.6 billion in the Fiscal Year 2018 budget. Fiscal Year 2018 ends on September 30. But so far, the FTA has only released $1.3 billion of the $2.6 billion that was appropriated. Transit agencies now perceive a risk that the funds will be left unspent by the FTA and never reach them. During this fiscal year, the FTA has approved only three transit projects for construction grants. And two of those — Caltrain Electrification and Maryland’s Purple Line — only advanced after concerted public pressure campaigns. Another eight projects have received approvals for earlier stages of the funding process. By comparison, in Fiscal Year 2016, the final year of the Obama administration, the FTA gave seven projects the go-ahead for construction grants (known as full funding grant agreements). An additional 22 were recommended for other grants or benchmarks on the path to full funding. If the Trump DOT gets its way, the pipeline will shrink even more. Projects in the pipeline but not yet approved for full funding grant agreements include Phoenix’s South Central Light Rail, Los Angeles’s Purple Line Extension, Minneapolis’s Orange Line Bus Rapid Transit, Durham-Orange Light Rail, New York City’s Second Avenue Subway Phase II, Milwaukee’s East-West Bus Rapid Transit, and Seattle’s Center City Connector, among others. In other words, the Trump DOT wants to stop federal funding for transit projects. It’s a threat this White House has made before. Since Trump has taken office, Congress has appropriated funds for transit expansion even when the White House did not want to. Trump’s budget outlines call for slashing federal transit funding, but Congress has made relatively little adjustment to prior spending levels. In May, the House Appropriations Committee voted to fund transit capital grants at $2.6 billion again. Under the law, 85 percent of the Fiscal Year 2018 transit capital grant budget — or $2.25 billion — must be allocated by December 31, 2019, a measure included at the insistence of several dozen U.S. representatives [PDF]. Any of the remaining $350 million that isn’t spent will still be available for four years, at which point it would go back into the treasury, according to an FTA spokesperson. But by slowing down the grant process and injecting more uncertainty, the FTA can still wreak havoc for transit projects. 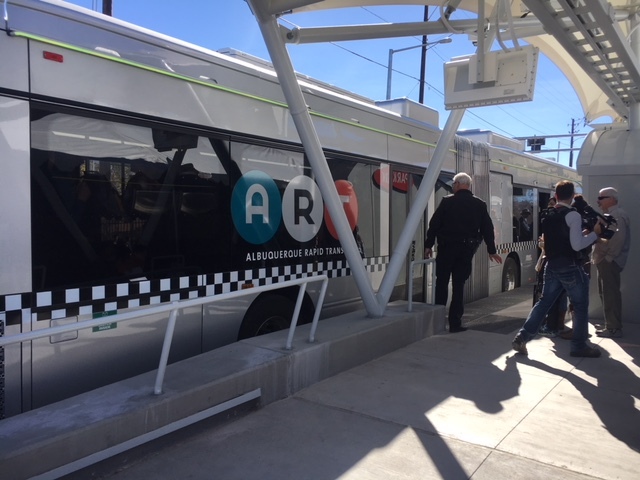 In Albuquerque, for example, the ART bus rapid transit project was built on the promise of FTA grants, but the city is still awaiting federal payments. The delay is causing political embarrassment for project backers — which may be the point. But now the prospects are much more uncertain, even though the 2017 federal budget allocated $50 million to the project. The FTA has yet to release the funding through its Small Starts program. Berry, whose term ended last year, is getting hammered by the press and new Mayor Tim Keller. “This notion that somehow we’re just waiting for guaranteed funds is factually inaccurate and it always was,” Keller told the Journal in March. Local officials hoped they would receive the grant when Congress fully funded the “Small Starts” program in March. New Mexico’s congressional delegation has been lobbying the FTA to release the funds, so far with no success. Clearly, partisan Republican resistance to transit is one factor at work. The party’s 2016 platform called for zeroing out federal transit funds. Chao, the wife of Senate Majority Leader Mitch McConnell, is an alum of the Heritage Foundation, which promotes the idea that transit funding is an inappropriate use of federal dollars. Just this week, the FTA issued a memo (title: “What is a Federal Transit Project?”) which states that the agency “is holding this national online dialogue to provide stakeholders with the opportunity to share how the definition of a federal project may impact the timely and effective implementation of transit projects.” It may sound harmless and vague, but in the code of conservative ideology, the memo calls into question whether transit projects deserve federal funding. The lack of clear leadership at the FTA may also be a problem. The Trump White House has yet to appoint a permanent director for the agency, which is currently led by acting administrator Jane Williams. Past administrations have typically filled the position within a few months, but Trump has gone more than a year without doing so. Whether the FTA finalizes funding agreements before the end of this fiscal year or not, the agency has already undermined local confidence in its transit grant programs. Some transit agencies have started to adjust their plans. While many California transit agencies are still applying for New Starts and Small Starts funding, others “are forging ahead with the idea that the federal government may not be there for us in the same way that it has been in the past,” Eidlin said. California is an affluent state and its transit agencies have resources that are not available elsewhere. Cities in red states or economically struggling areas are not so fortunate. They need federal support to invest in transit, and they can’t count on it any longer. Combine this with the prior administration’s policy of shifting capital funds to operating expenses in order to provide a funding source for rising pension costs. So that’s two administrations shifting money away from the future of mass transit. I don’t expect it to stop. Easier idea: states should learn how to choose better projects (cost no more than $50K/rider for rail w/ operating costs no more than $1.50/rider), and bring construction costs in line with the rest of the world so they can reduce dependence on Trump. Donald Trump won’t be President forever, so cities need to learn how to choose better projects and get construction costs down for their own long-term good. And if we’re going to end federal commitment to transit funding, we should eliminate federal highway funding, too. Come to think of it, the Clinton Administration shifted some money from the Transportation Trust Fund, which had a surplus at the time. I don’t remember Bush II Administration policies on funding transit for the future, but I can’t expect they were good. Your last point may be the best available outcome. The irony is that many red state Republicans now believe that transit must be a part of the transportation mix which is why I assume Congress has operated with a more business-as-usual approach. Commuter and light rail have seen popularity in suburban, more Republican-dominated districts. Killing transit capital funding would not be a good look for suburban conservative representatives. This is actually a reasonable take. It might push municipalities, counties, and regional bodies to pick their transit modes more wisely. Light rail has its useful applications, but the slew of bad rail projects that are put forth because people just want trains is bonkers. FTA could accomplish that by changing its criteria. But there is no new-and-improved project selection process coming, nor is there any commensurate decrease in highway funding. It’s just the party that’s systemically biased against cities hacking away indiscriminately at programs used by cities. There were significant increases in several programs that Trump hated on in this year’s Omnibus bill passed by Congress. No, seriously, I think all federally funded rail/bus projects should be required to (1) be a capacity and/or operating efficiencies upgrade, (2) keep construction costs no more than a factor of 2 to comparable projects, and (3) have capital costs below $40K/rider (maybe more leeway if operating costs are reduced). Meh, as long as the pols promise another freeway, no one will bat an eye. Better value for money is badly needed. Trump’s motivation is not better value for money. He is not being stingy toward highways, and he is offering no roadmap for cutting costs. In some cases, the actions his people are taking (holding up the Hudson Tunnel Project FEIS, for one) are likely to increase costs. Newsflash – America is broke and in the hole $20 Trillion. At what point do we all wake up and realize the spending has to stop? So then you support cutting funding to highways, the military, any number of other wasteful programs, and reinvesting in transit, which is more cost effective? No, no, you’re just interested in making a specious argument. So, time limits for Medicare (say 15 years — or 17 for females and 13 for males)? How about no custodial care (nursing homes, home health care, personal care) for seniors who have exhausted their assets under Medicaid unless some other household is willing to kick in 2 percent of their income to help pay for it? You mean spending that benefits generations born after 1957 has to stop. The US defense budget is $590 billion a year. At a rate many times over what other countries spend per capita. I agree we need to stop this kind of reckless spending and use it on things most Americans need like transportation and healthcare. Gateway is exactly the kind of project I’m thinking about when I talk about using the time while Trump is in office for cities to work on lowering construction costs and choosing better projects. Gateway costs $160K/rider. That per rider cost is more than 3-4 times that of what most U.S. rail projects cost, and 6-31 times the per rider cost of most European rail costs. That’s a disaster. If Cuomo would use his political capital to bring the costs down to $50K/rider, NY and NJ wouldn’t need to depend at all on Trump. Bringing construction costs down to only two times what it would cost Paris, London, or Tokyo to do a comparable project would help NY long-term. And then we can get rid of federal highway funding. On the other hand, many of those suburban commuter rail and light rail projects have high per rider capital and operating costs while adding little, if any, capacity. I mean — can anyone name one capital project under Trump administration threat that costs less than $50K/rider? So killing those kinds of line extension expansion projects to the sticks might be a blessing in disguise. If you voted for Trump. you voted for US Budget Deficits of in excess of One Trillion for as far as the eye can see. If you voted for Obama you doubled our deficit ($10 Trillion to $20 Trillion) in 8 years! Even if you cut our military spending in half ($300 Billion/yr) and put it all to paying off the deficit – it would take over 66 years not even including interest! THAT IS STUNNING AND SAD NO MATTER WHAT YOUR POLITICAL BELIEFS! Of course, it wouldn’t matter because the U.S. would likely cease to exist without a strong military. Better start cutting the military then, Ron Paul. 🙂 It’s over 54% of the federal discretionary budget, compared to 2% for transportation. The U.S. “would likely cease to exist” if it cut its military? You really believe that? The U.S. spends $550 billion year on the military. Russia spends only $69 billion a year on their military. And allegedly Russia is annexing countries and toppling U.S. elections with their paltry forces. If you are a member of Generation Greed you robbed a good chunk of the future from the generations to follow while pointing the fingers in a circle! The nasty political battle is an attempt to avoid a fair share of the blame. The political reality is that the battlers somehow can overcome their differences to agree to defer the costs to exempt themselves from it. Trump is stealing money from cities to give it to others.